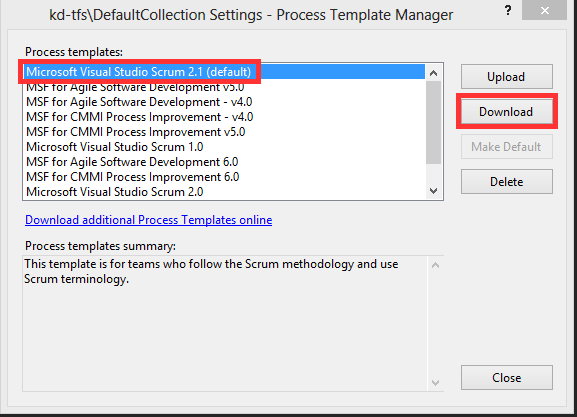 This wired error was throw by the TFS 2012 project creation wizard while atempting to create the first new project since applying the TFS 2012 Update 1 using Scrum 2.1 template. The full error text goes like this. In this query of course you have to replace the [Tfs_DefaultCollection] database name with your own tfs database for the collection in which your are trying to create the new team project. If the project creation wizard reports problem with some other state than you should replace the “In Progress” part with the state in question. The query should produce something like this and here you can see the correct spelling of the constant in question. 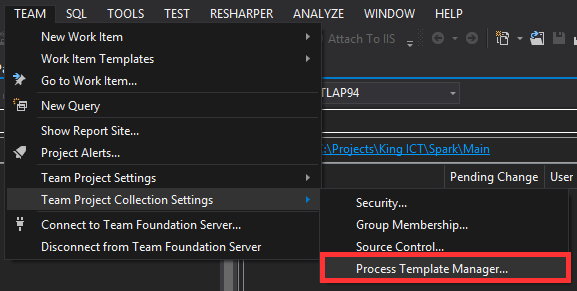 Locate all of the instances of the “In Progress” string, you should note here that the Process template manager validation process is case sensitive while SQL is not (by default) and the problem is that the string in the database is “In progress” and in the config file is “In Progress”. This seams to be a no-no, therefore change the casing in the config file to match the one in the database to fix your problem, save the file and upload it back to TFS trough the Process template manager. Be on your merry way creating new team projects as much as your heart desires.